Unknown Patie--er, Mason Powers, Journal Entry #1: "I'm a little lost,here! I've woken up in just about the crummiest bed I've ever seen before in my life, and I'm just beginning to piece together what's happening. After looking at the chart on the end of my bed, I've worked out that I'm in some kind of.. hospital. I remember my doctor - Farouk Hashish. Last I remember, he was standing over me with some other man saying he'd 'take care of me' - and I didn't think it'd be friendly! After finding a little common cause with the guard outside my cell, I've managed to sneak my way around the floor, and even have a CPR dummy pretending to be me while asleep! 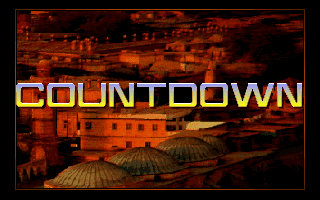 It's time for me to begin searching this horrible place properly.."
Countdown is not a particularly friendly game. I've only played it very shortly, and have managed to get killed roughly fifteen times in the opening scenes. I'm kinda going to be at a loss, and I'm likely going to have to have an external catalogue of my savegames, as there's only an eight character limit! (Kinda hard to give myself much info in the save games as I've promised myself I'll be doing for the sake of blogging, given.) The interface is also very unfriendly. For instance, in order to go through a door, you first have to get closeish to the door. Sensible, but just clicking on the space near the door has a very low percentage success rate, it seems, so I instead use the arrow keys to get near the door. I then have to OPEN the door, clicking on the door once and then twice for confirmation. Then, while at the door, I have to GOTO the door to move through it.. *sigh* There's technically keyboard shortcuts, too, but they require use of the function keys, which I find quite grating. Obligatory rants out of the way? Okay. Let's get started. 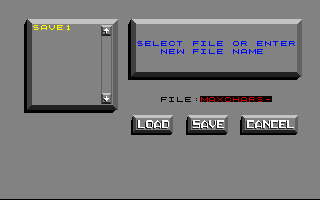 The save selection screen. I've already seen it more of it than I'd like to, reminding me of its shortcomings! "Make sure he remembers nothing." "Don't worry - I'll take care of him.."
The interface is interesting enough to be worth an immediate comment. You're given the choice of how to interrogate the people you're talking to - 'help' (offer to help the person with their problems, first discovering them and then trying to think of ways to help them from there), 'hassle' (annoy the person into submission! ), 'pleasant' (disarm them with your charming wit), 'bluff' (try to make the people you're talking to think you have some sort of advantage over them), 'ask about' (which gives you a short list of names/items to speak with the person about - in this case, I only have my own name, Nirva's, my doctor's and Sanctuary, but that list is sure to grow) and 'use' (give an item / use an item on the person). From talking to Nirva, I don't believe that you can actually be penalized for going through all of the conversation options - they just get to an end and you then either get blown off or told that 'you're out of ideas'. In this instance, I learn quickly that Nirva is a big fan of bugs - and, funnily enough, there's not only a gigantic bug in the room, but I have a cup to trap him in! After showing the bug to Nirva, losing both the cup and the bug, on the next sweep through of the halls a tray of food is slid underneath my door! Success! I've bribed the guard! This 'tray of food' DID allow me to use the 'taste' option. However, trying to pick it up, I 'don't really want it'. 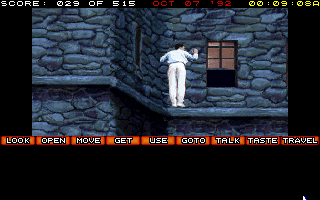 Mason Powers: crossing ancient stone buildings in sensible slacks. Getting through the window, there's just about nothing that could have prepared me for what comes next. 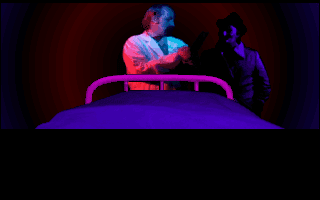 As I mentioned in the introductory post, I found that the worst parts of Tex Murphy were the ludicrous speeder scenes. They just didn't seem to have any real obvious purpose, and several people pointed out at the time that the game started out as a flight sim, and just 'became' a detective game. This? Well, this wanted to be a stealth platformer game. I'm not joking. The purpose is pretty obvious - you have to avoid the guards while you slip through the doors. Metal Gear Mason reporting for duty! So, the forwards path from here is pretty obvious. 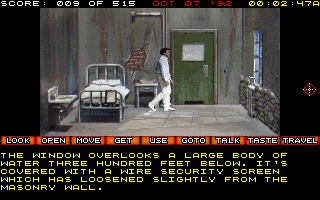 There's one guard doing a round through a rectangular building with an overhanging lip on each corner. 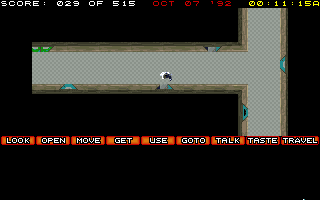 The game actually uses the timer in the top right, so you just have to time your way using his rounds - Nirva will walk in a straight line, hold for about five seconds, turn down the lip I just mentioned, turn back around, then walk in a straight line. To my mind, this should only take him about four minutes real time, but it actually seems like it takes more like twenty for him to notice that you're not actually in your room. So, given this update is probably going a little bit long by this point, I'll say right away that there's not actually too much going on here. Several empty/emptyish rooms, including one which has a skeleton named 'Perry Goldman' that's been in for 25 years! (According to the chart, he's a model prisoner, as he's been completely fine by his plight the entire time - no change in his behaviour between 1971 and 1978! The caveat? He's a skeleton now..) The first room you go into that has anything much of interest, though, is a monitoring room with a naked guy in it..
Mr. Spaulding reacts well enough to us telling him what's going on and seems candid, but he refuses to give me any information until the radiator is turned on. As I can't work out from what I have available how to turn it on for him, I'll mark this in the 'later' pile and keep going through the rooms. Continuing in a clockwise pattern (as that's how our friend Nirva goes, even though he comes from counterclockwise when Mason is in his room), along the top wall is a large room with a wire coat hanger (yoink!) and a CPR dummy (which has 'a remarkable resemblence to Mason') and a coat hanger inside. While at this point I hadn't received the 'you were found out of your cell' death, the game spells it out so clearly that the second I see it I immediately know that the dummy's to go into bed. Couldn't spell it out any more for me, game? Why not say 'PRESS THIS BUTTON TO NOT DIE', like modern games? 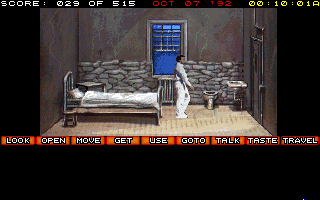 Continuing around clockwise, I find a few more empty rooms, one with a man in a straitjacket who states to me that 'if I bother him again, he'll kill me' (he doesn't in reality) and in completing the circle, a supply closet with a whole bunch of useless bed pans and anti-bacterial agents that I can't use, a fire extinguisher that - you guessed it, I can't use, and.. a pair of scissors, which I pocket. Given this is already going forever, I'll sum up here.. the game's taken me a good hour already, but most of that was just getting used to the interface in truth. Will hope to be out of the hospital by the end of the next post! For my own little flavor on this shindig, I'll leave you with my current inventory at the end of each post, so you can all laugh at my misfortunes (and I can cover what I've missed out on) at each new stop. The game is already paying homage to the other one that's being played at the moment. Classy, right? Note regarding spoilers and Companion Assist Points: There's a set of rules regarding spoilers and companion assist points. Please read it here before making any comments that could be considered a spoiler in any way. The short of it is that no points will be given for hints or spoilers given in advance of me requiring one. Please... try not to spoil any part of the game for me... unless I really obviously need the help... or I specifically request assistance. In this instance, I've not made any requests for assistance. Thanks! Since we are now having a team of reviewers, we might as well be playing two games at the same time – that worked quite well, when Trickster shared the podium with a guest blogger. 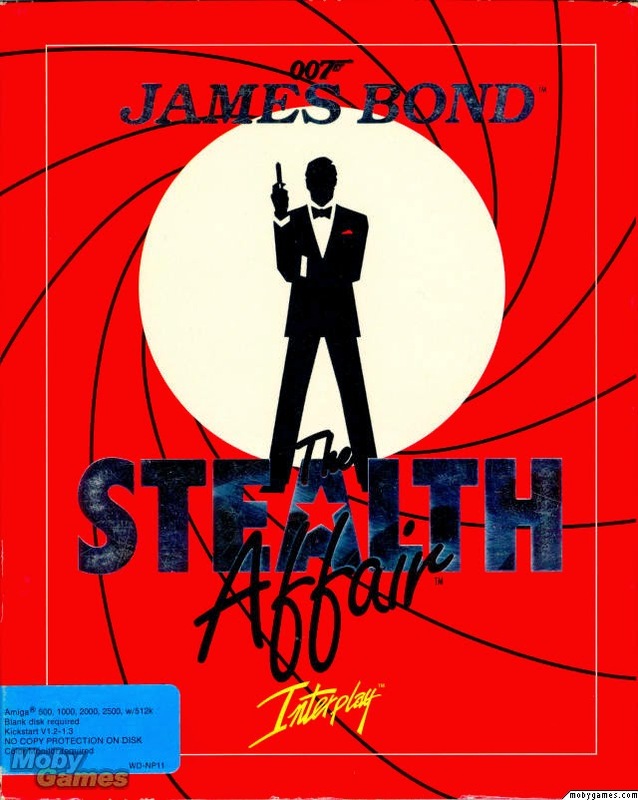 We'll skip the Spellcasting 101 for now (don't worry, its time will become later) and let Joe Pranevich get his hand on Operation Stealth or James Bond: The Stealth Affair, as it is also called. 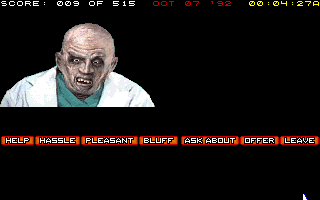 Joe is currently busy firing up his Dosbox, so I'll do the introduction this time. "The title still lacks something..."
"That's it! James Bond will sell anything." When regular readers hear that we are about play a French game, they will probably ask: how awful this is going to be? The best French effort thus far, Future Wars, was stunningly beautiful, but its plot was derivative and game play required inhumane efforts. 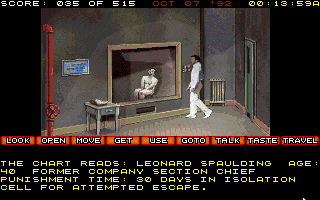 Operation Stealth was actually published by the same company as Future Wars, Delphine Software. 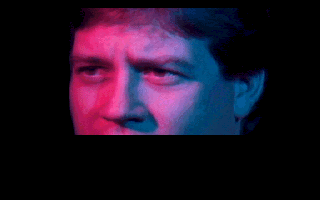 Most of the developers of Future Wars were still involved with Operation Stealth: Paul Cuisset was involved in design and programming, Jean Baudlot was responsible for music and Marc Minier provided the effects. Notable addition to the developer group is the co-designer and programmer Philippe Chastel, who would go on developing the scenario for the next Delphine Software adventure game, Cruise for a Corpse. None of this raises any hopes for Operation Stealth, but we can hope that the developers have learned from the failings of the first game. The game title reveals that this will be a game of espionage and manual goes into great lengths describing all the various gadgets belonging to the tool kit of an average agent. I'll let Joe Pranevich reveal more about the game in the next post, but I should probably tell that the game has actually been sold under two names. 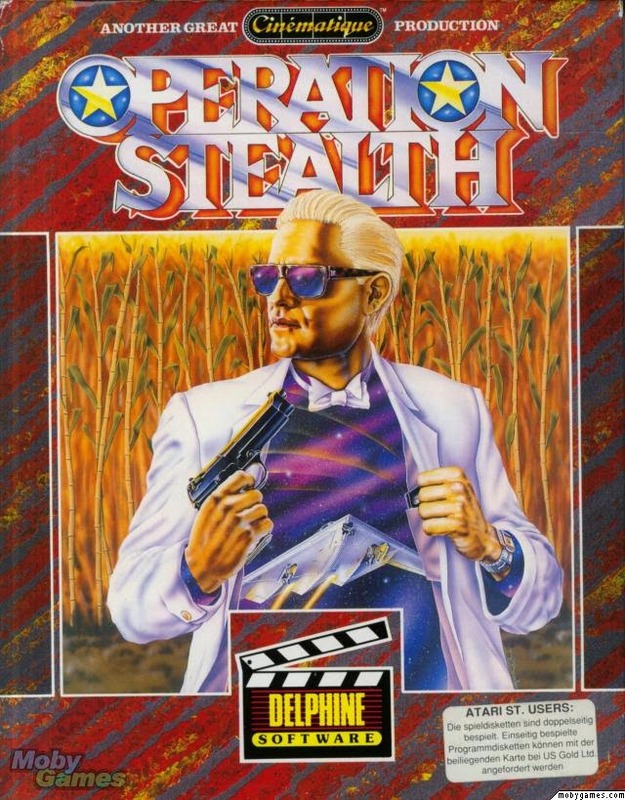 Here in Europe the game was sold as Operation Stealth and that's the name I am familiar with. Apparently Delphine Software thought that American adventure gamers would not be so enthusiastic to step into the role of John Glames, so they bought a licence for the name of James Bond, just for US markets. It seems that nothing else was changed in the game itself, except the name of the hero, which caused the embarrassing detail that James Bond, an agent of British intelligence service, MI6, is for some reason working in CIA. ...oh yes, he is Felix Leiter! Note Regarding Spoilers and Companion Assist Points: There's a set of rules regarding spoilers and companion assist points. Please read it here before making any comments that could be considered a spoiler in any way. 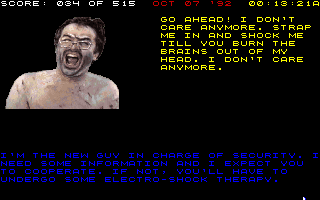 The short of it is that no CAPs will be given for hints or spoilers given in advance of the player requiring one. As this is an introduction post, it's an opportunity for readers to bet 10 CAPs (only if they already have them) that Joe Pranevich won't be able to solve a puzzle without putting in an official Request for Assistance: remember to use ROT13 for betting. If you get it right, you will be rewarded with 50 CAPs in return. It's also your chance to predict what the final rating will be for the game. Voters can predict whatever score they want, regardless of whether someone else has already chosen it. All correct (or nearest) votes will go into a draw. ...And then some generic hard rock music into a title screen. COUNTDOWN! It's almost sad to be writing instead of reading these, but I'll try my best not to let anyone be disappointed.. well, aside from the fact that we're leaving QFG2, which I've already mentioned is quite possibly my favourite game of all time. 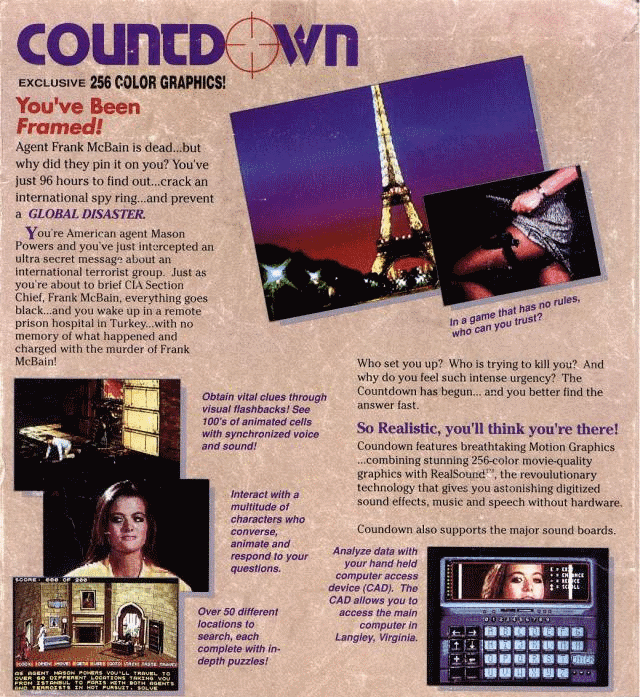 Countdown: An Interactive Movie of Intrigue, Espionage and Suspense appears to be the next in a relatively short line of games we're going to see from Access Software - A.K.A. the creators of the Tex Murphy franchise. 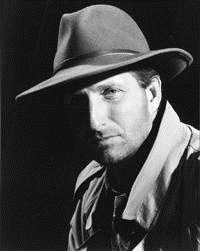 Seeing the familiar faces of Brent Erickson -- but more importantly, Chris Jones (the face of Tex Murphy) under the 'created and designed by' column is quite heartening, I'll admit freely, as I was quite worried this one could easily be a hunk of junk! At least the story is just about guaranteed to be good. Comparing the credits of the two games, it seems that Mean Streets had quite a few extra people working on it, though - if Mobygames is to be believed, only eight people actually worked on this game, which is a little concerning to say the least. (One of them is only there for 'additional text', at that, whatever that means!) Still, I've got faith in the ability of this crew, as all of the people who are listed in this game are veterans from Mean Streets, and the majority of them returned for Martian Memorandum - so they can't have mucked up too badly. The manual doesn't exactly give amazing amounts of detail in regards to what I'm to expect, and isn't very graphical in nature. Apparently, I'm an American Intelligence officer (not Molly Meldrum, as I had so hoped - any Australian reader can fill you in) waking up in a government subsidized asylum for 'people who know too much'. But I have that ever-so-fun plot point of amnesia to deal with! (That said, the back cover informs me a little more, telling me that I'm Mason Powers, that I've just intercepted an ultra secret message about an international terrorist group - and that the CIA Section Chief, Frank McBain, is dead - allegedly at my hands! I'm already expecting there to be several playthroughs though, as there's another listed issue - 'You have 96 hours starting 12:00 am Wed. Oct. 7. You have until Sat. Oct. 10 at midnight to solve the game.' Ooh, boy! I love it when games give me deadlines! *gag* Still, that's not to say that the deadlines are going to be impossible, right? 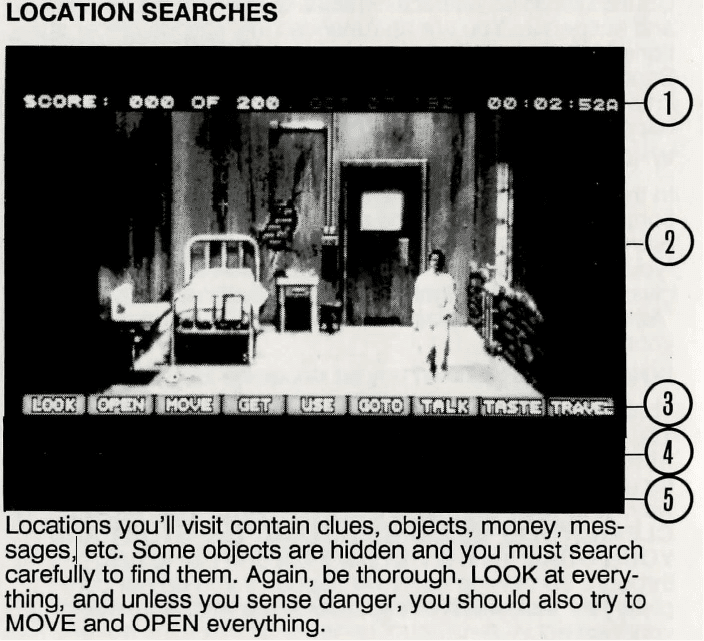 I'm definitely not heartened by its warnings of 'save often' (a common adventure game mainstay in manuals and death screens alike) - but I'll admit that my warning klaxon does seem to be firing away at the statement that I should 'play with a friend' and that I should 'play with the lights turned down for atmosphere'. Heck. There's even a hint book ad. And a help line ad. Yeeeah... I think Trickster might have picked the right time to stand aside.. 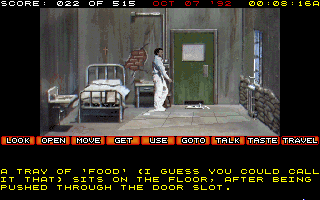 The game appears to be using a modified version of the Tex Murphy/Mean Streets engine, which means I at least know what I'm likely to be in for as far as an interface - somewhat clunky, but mostly effective. It also shows pictures in the manual of a familiar conversation interface, even though I'm hopeful that they've at least taken out the 'remembering everybody's full name' sections of Mean Streets... but I'm really getting ahead of myself, here. I'll let you all know ahead of time that the blogging part of this is very new to me, and the thought of taking intermittent screenshots is definitely not one I'm used to.. doubly so with a timed game. With any luck, though, I should be able to get around my troubles and just focus on getting thoroughly lost in the world of Countdown. My copy forces me to choose my interface/sound options every time I run it up, even with it 'installed', which is quite annoying - and just from a few moments of fiddling with the opening screen, I can already tell that I'm going to be cussing a great deal at the game engine, making me click multiple times on things et al - I'll try not to belabour the point, though. Anyhow. Let's get on with it! The 1990s loved these slogans, didn't they? Did anyone ever really feel that 'they were right there'? Huh? 1) Who does all the administrative work, like adding the reviews into blog and putting scores into the spreadsheet? I've already volunteered for the job, but if someone wants to become a co-admin, I'd love to share the honour. 2) Who will play the games and do reviews? I've also said that I can play and write reviews occasionally. Still, I won't be able to do that continuously, so here the efforts of the whole community would be most required. I've already got few volunteers for a reviewer pool: Aperama, Joe Pranevich, TBD and Deimar at least have expressed interest (sorry, if I overlooked someone). Still, the more committed reviewers we get, the better. Note that I've already said that I can do the introductory post for any game, if the reviewer doesn't want to spend time for that. 3) Who will get to play what game? I think it's best to figure out first what to do with these games, before thinking about the later games. So, anyone particularly interested of any of these? In the past, we could rely on Trickster having a consistent idea how to score the games. As a guest blogger, I noticed how hard it was to take care that the scores I gave followed the same logic as Trickster's scores. So, do we still want to score games? If so, do we still use the PISSED-system? Do we need to discuss what are the criteria for the scoring or should every reviewer just play by his/hers gut instinct? 5) What to do with CAPs? One of the most original features of this blog has been the CAP system, and it's been an important part in bonding the TAG community. Do we still want to hold on to the system? If we do, who gets to decide who gets how many CAPs (community vote?, admins?, something else?)? Also, while Trickster was still blogging TAG, collecting CAPs had a clear purpose, because they could be used for moving Borderline and Disregarded game to Trickster's playing list. Do we still need such a system (at least it was always fun to see what games got enough points) or is it completely useless? So, this is what I had in mind - let the discussion begin! I apologise for leaving this so long. It has weighed heavily on me for a few weeks, but the last thing I wanted to do was rashly pull up stumps, only to renege on the decision shortly afterwards. As you’ve likely guessed from that opening, I will not be continuing with The Adventure Gamer for the foreseeable future. Believe me when I say that this was a decision that took many months to come to. It is however one that I now feel very comfortable with. My reasons for stopping the blog are not to do with limited time, family matters or reluctance to put the effort required in. The truth is that gaming is only one of my passions. Since I started The Adventure Gamer close to three years ago, I’ve done little else with my spare time than play and blog through 45 adventure games. My love of movies, books, TV shows, music, and most of all, other video game genres, have had to take a backseat to this strict, narrow focus. That was fine for a while, but over time I naturally started being pulled in different directions. One week it might be music, the next comics, the week after that movies. I found I was rejecting these itches and forcing myself to go back to the likes of Earthrise, Les Manley and Altered Destiny when it wasn’t really what I wanted to be doing. There was only so long this commitment could last. I began wondering whether there might be a way to bring all my passions together, mapping out a new blog idea whilst sitting on the bus or lying in bed at night. When my family and I came back from Thailand a few weeks ago, I still had a couple of weeks of holiday time to occupy. I sat down and started a new blog. My intention was to see whether this new idea worked. Whether it felt…right. I’ve now written upwards of 20 posts, covering the whole spectrum of my interests. I feel revitalised, and genuinely excited to be able to cover new topics in differing mediums every couple of days. I can’t go back now. So why didn’t I do this a year ago? The answer is you guys. My intention was always to build a community when I started The Adventure Gamer. I was delighted when it actually started happening, initially thanks to Chet advertising on the CRPG Addict blog, but eventually The Adventure Gamer stood up on its own and thrived. There are so many fantastic personalities here, and I felt a real responsibility to keep things going for as long as I could. I won’t mention a long list of names here, as I would undoubtedly forget someone critical to the blog’s success. 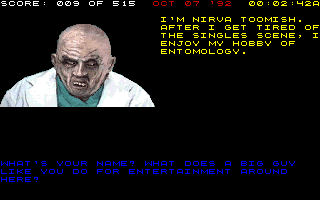 I would however like to thank Lars-Erik for sponsoring the blog with games. He’s an amazingly generous and thoughtful man that I wish I knew personally. As for all the other regulars, please accept my sincere thanks for your involvement and enthusiasm. I hope at least some of you will come with me on my next endeavour. I will respond to comments on this post for a while. I will also announce the launch of my new blog when the time comes. It will be a while though, as I’m determined to get the format right from the outset this time, and would like to have at least fifty or so posts up my sleeve from the get go. I don’t want to reveal too much about it just yet. Let’s just say that in the last few days I’ve written about Doctor Who, a surreal Japanese horror movie, an Atari 2600 video game and Wonder Woman. I’ve had a smile on my face the whole time too.